The Interlocked Long Blue Earth from PB Weir Electrical has been designed to solve a pressing need in the Rail Industry. The equipment has been specially enhanced in order to address the potentially fatal procedure of removing the equipment in the incorrect order of use. To ensure that the Line End clamp is removed prior to the Earth End clamp, it incorporates a special key which must be used to remove the Earth End clamp. The tamper-proof lock arrangement is an integral part of both clamps and P&B Weir can provide up to 20 combinations, this is to deter ‘master keys’ being used to fool the system. This interlocked long blue earth is for providing temporary earth bonds between overhead catenary or contact conductors and earthed rail sections or recognised earthing points. 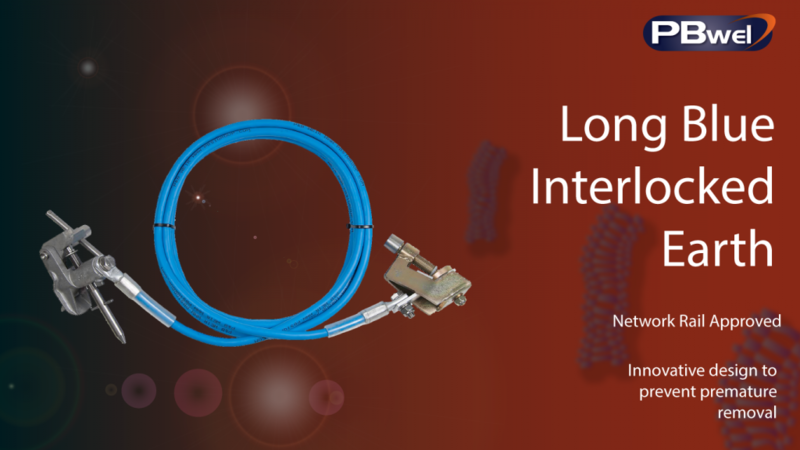 Interconnecting Leads are made of 50sqmm multi-stranded Aluminum with Aluminum palm type compression terminations and blue Arctic-grade PVC insulation. The S9BI Line End clamp is made from Aluminum alloy and stainless steel fasteners. These are suitable for application by the S9D operating socket. Insulated Operating Poles are glass fibre insulating poles with open weave handgrips bonded to the lower pole section. Available in standard 4ft (1.22 metre) sections with machined joints to provide rigid assembly by a double sided snap action, spring loaded locking device. An S9D type light alloy operating socket should be fitted, the socket is then used to rotate the Line End clamp’s operating screw, to secure to the line.